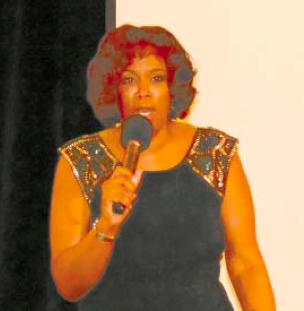 DEBORAH DUNCAN, well known TV personality on KHOU-TV Channel 11, was the featured speaker at the 37th Annual Chamber Gala. HOUSTON – It was certainly a Gala Evening, as several hundred Chamber members, guests and friends gathered last Jan. 25th at the Houston Hobby Airport Marriott hotel, for the 37th Annual Gala event. An exquisite meal, served with candlelight and wine, set the tone for the evening. The featured speaker was Deborah Duncan, emmy award winning TV host of the program Great Day Houston. Prior to Houston, she was a radio and TV personality in Austin, Dallas and New York. After telling a bit about her life, including amusing tales of her “evil sister” that she had to compete with, and her military family’s travels through Taiwan, Japan, Texas and elsewhere, she turned to stories of her community service, and the “Life’s Lessons” that she gleaned from that. 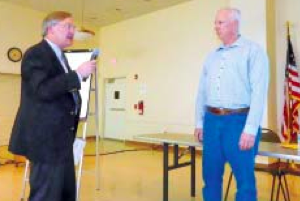 Fred Lewis, president of TexansTogether, confronts EPA Project Manager Gary Miller with a series of questions regarding the lack of environmental health studies by the state and federal agencies, and the standards being used by EPA to make judgments on the Waste Pits. HIGHLANDS – At a public meeting here to review progress in removing toxic waste in the San Jacinto river, Channelview residents learned of the status of the deposits near their community. EPA’s Gary Miller revealed a new bit of information of grave importance: the South Impoundment, which until now has not been part of this study, is larger and contains more toxins than the North pits, and will become the next step in the Superfund study. This area therefore threatens homes in the Channelview and west bank areas. Over one hundred local residents packed the San Jacinto Community Center last Thursday night, Jan. 30, for a public meeting to hear the federal EPA, or Environmental Protection Agency, report on the status of work to solve the toxins in the waste pits in the San Jacinto River. They presented six options ranging from cover in place, to full removal of the contaminated sediment. 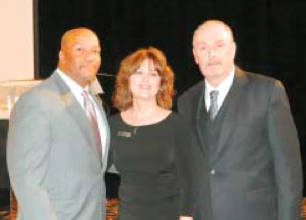 NEW CHAMBER PRESIDENT MARGIE BUENTELLO poses with outgoing board chair Wilfred Broussard, Jr. and new chair Greg Ollis. NORTH CHANNEL – The Chamber Gala was the setting for the announcement, from new board chairman Greg Ollis, that Margie Buentello had been selected as the permanent President and CEO of the North Channel Chamber. Margie has been working for the Chamber for 17 years, most recently as the Membership Assistant. In this role, she has provided assistance and guidance to chamber members and activities. In this role, she has had the opportunity to know each of the Chamber’s members first hand.